Sharples, Alberta is named after John Sharples, a C.P.R. railway fireman who won the Distinguished Conduct Medal during the First World War. Even though Sharples has always been a small settlement, it handled an exceptional amount of grain. Being located in the picturesque Kneehill Creek valley, Sharples' elevators were vital to farms on the north side of the creek as crossings were few and far between. This P&H elevator was constructed in July of 1923 with a capacity of 28000 bushels. It still wears much of it's original tin siding. 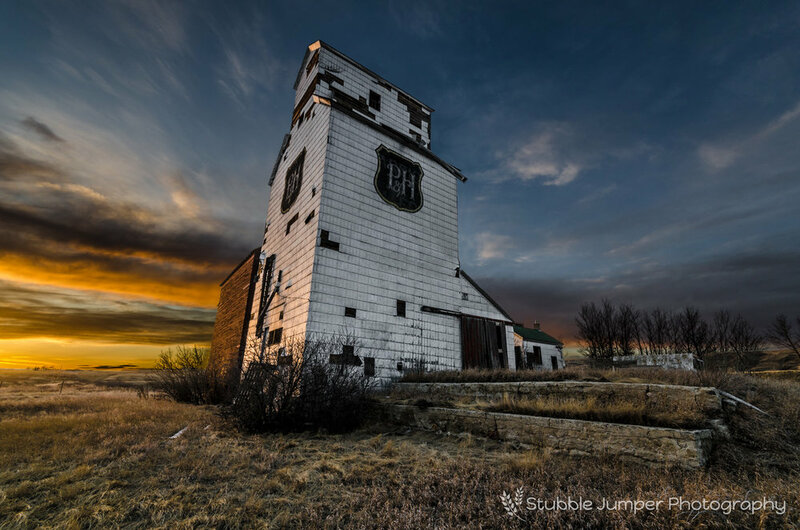 The elevator was abandoned in 1982 when the Alberta Wheat Pool elevator (built in 1927 by Alberta Pacific Grain Co.) that stood beside it was demolished. Two annexes were built in the early forties. The one on the west side is still standing and held 26000 bushels. The smaller annex on the east side held 14000 bushels and has disappeared from the scene. Parrish and Heimbecker was established in 1909 by William Parrish and Norman G. Heimbecker and has grown to be one of the largest grain handling companies in Canada.